Noted for its elegance and grandeur, Cooch Behar Palace, also called the Victor Jubilee Palace, is a landmark in Cooch Behar city iin West Bengal State. It was designed like the model of Buckingham Palace in London. Now this historical Cooch Behar Palace is under supervision of the ASI (Archaeological Survey of India). 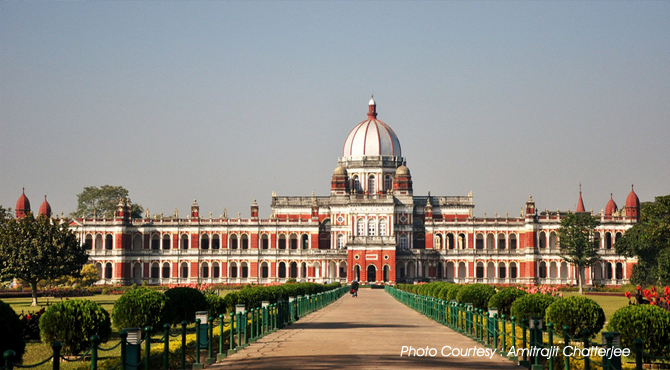 This magnificent Palace was constructed in 1887 AD during the reign of the 21st 'Koch' king Maharaja Nripendra Narayan. A wonderful example of classical Italian Renaissance style of architecture, it is a brick-built double-storey structure covering an area of 51,309 square feet (4,766.8 m2). The whole structure is 120 mlong and 90 m wide and rests 38 m high above the ground. The Palace is fronted on the ground and first floors by a series of arcaded verandahs with their piers arranged alternately in single and double rows. The Palace is slightly projected at the south and northern ends and in the centre is a projected porch provide the main entrance to the building through the Durbar Hall. The Hall has an elegantly shaped metal dome which is topped by a cylindrical louvre type ventilator. This is 124 feet (38 m) high from the ground and is in the style of the Renaissance architecture. The intros of the dome is carved in stepped patterns and flanked by a small elegant balcony with twelve window openings at the base. This adds variegated colours and designs to the entire surface. The palace has various halls and rooms which includes the Dressing Room, Bed Room, Drawing Room, Dining Hall, Billiard hall, Library, Toshakhana, Ladies Gallery and Vestibules. The articles and precious objects that these rooms and halls used to contain are now lost. Of the fifty halls only few are used as museum and other parts are blocked for visitors. The present museum was established in 2002 with the antiquities and objects collected by the Kolkata circle of the Archaeological Survey of India as well as the state government. The exposition consists of seven galleries. The frontal facade consists of a series of arches resting by an alternate arrangement of narrow and broad piers to contain single and double Corinthian pilasters respectively. A porch is projected in the center to provide main entrance to the building through the Durbar Hall. Recalling the memory of St. Peter's Church at Rome, the Durbar Hall is dodecagonal in shape, resting on four arches supported by massive Corinthian pilasters and projecting a lantern at the top. In the center of the Durbar Hall, the marble floor contains the royal insignia in pietradura. Certain rooms deserve special attention for their beautiful paintings in the ceiling as well as in the interior wall surface. On the first floor is the Durbar Hall of the palace which is now the main hall of the museum. It exhibits royal insignia at the center, painting of coronation of Maharaja Nripendranarayan, photographs of royal family of Cooch Behar state. Few excavated materials such as - stone heads, busts and terracotta plaque from Rajput site at Gosanimari near Dinhatta in Cooch Behar district have been displayed. Collections on the 2nd Gallery include the billiard room and photo blow ups of the royal personages. Gallery 4 and 4 are the ethnic galleries organized with the help of Anthropological Survey of India wherein life styles of different communities in Cooch Behar region with their daily use, objects of occupations, masks, musical instruments etc. has been displayed. Gallery No. 5 & 6 are the sculpture gallery wherein masterpieces of sculptural art datable to 7- 8th century - 12 th century AD have been displayed. The stone sculptures of Brahmanical faith such as Vishnu, Brahma, Surya, Mahismardini, Simhavahini, Navagriha etc. In Gallery no. 6 sculptures of Brahmanical and Buddhist pantheon such as Vishnu, Surya, Sadyojata, Uma Mahesvara, Parvati, Tara, Avalokitesvara etc have been displayed. The objects of galleries 5 and 6 are mostly collected from different police stations and custom offices of North Bengal. In addition to this, Gallery no. 6 also houses objects and antiquities like royal standard weights, iron dyes for making coins, badges of Cooch Behar kingdom and the Raj family of Cooch Behar. Museum open -10 a.m. to 5 p.m. Friday closed. This palace is illuminated on Saturday, Sunday & holiday in evening.